Situated just west of Ohio and just south of Michigan, Fort Wayne, Indiana is a bridge between three states. This gives local businesses access to a steady stream of trade across the three states, which combined with a thriving auto parts industry and other manufacturing operations provides jobs and wealth to the local population. 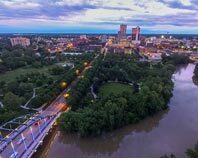 In obtaining all the supplies they need for these industries, the people and businesses of Fort Wayne know they can count on ExpeditedFreight.com. 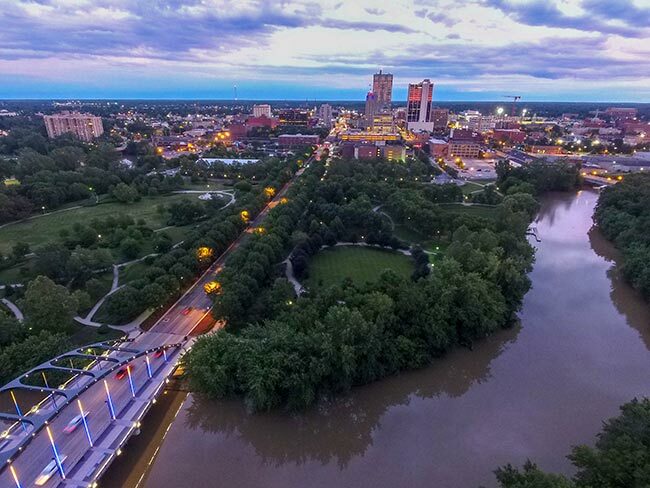 An expedited freight company with a proven track record of speed and safety, we ensure efficient, effective logistics for Fort Wayne and its surrounding metropolitan area. ExpeditedFreight.com's emphasis on speed and safety helps us to meet some of the most serious challenges of shipping in Fort Wayne. Local businesses have long had trouble getting their most important inputs on time without damaging them in transit. This is a particularly serious problem for manufacturers, such as the region’s General Motors facility, which have to avoid supply damage at all costs but work on highly tight production schedules. Standard carriers can’t meet those deadlines without driving fast, but doing so compromises safety, creating a shipping dilemma. ExpeditedFreight.com is no standard carrier, and has not been limited by traditional logistical dilemmas. We fuse speed with safety by planning every route we take carefully. We look for the shortest path from the starting point to the destination that does not place us at risk of hitting traffic, driving on bumpy roads, or being caught in a storm. In this way, we can deliver Fort Wayne customers’ goods quickly without lowering our standards for safety. Besides planning, ExpeditedFreight.com uses a vast coverage network. We have personnel and vehicles in virtually every US state and Canadian province. This means we can send a truck or van to load your goods from most starting points in as little as two hours, setting the stage for a rapid expedited delivery. Likewise, if you are shipping out of Fort Wayne, our personnel and vehicles will be available on the way to your destination. We can thus respond quickly if a vehicle breaks down or there is some other problem. First, it lets us look out for disruptions to the route, guide our trucks around obstacles, and limit delays. Second, it means we can tell you the location of your truck at any time; all you have to do is call our 24/7 customer service number. Whenever you schedule an ExpeditedFreight.com order over more than a minimum distance, we will put two drivers on the job. This way, they can switch between working and sleeping, so both are rested enough to drive safely. We also dedicate the vehicle to your goods alone, meaning nothing will get in the way of swift, safe expedited freight service. As one of the largest and most important manufacturing facilities in the Fort Wayne metropolitan area, Fort Wayne Assembly has been in operation for more than thirty years. During that time, it has produced some of General Motors’s most advanced vehicles. Today, this includes the GMC Sierra, as well as the Chevrolet Silverado. Fort Wayne Assembly benefits from its location at 12200 Lafayette Center Road in Roanoke, Indiana. This puts it right in the heart of the Midwest, allowing it to bring in supplies and send out finished cars to one of the most important economic cores of the United States. In order to meet the high demand of this area, Fort Wayne Assembly must maintain strong supply lines, and that’s where ExpeditedFreight.com comes in. We ship all the auto production supplies Fort Wayne Assembly needs, consistently meeting even the toughest of deadlines. We are particularly adept at fulfilling emergency orders. Whenever the plant needs a sudden delivery of some essential part it’s run low on, we get it there at top speed, thereby minimizing any loss in productivity. ExpeditedFreight.com plans all deliveries to Fort Wayne Assembly in detail, allowing us to find quick, safe paths to the plant from any of its suppliers. We also offer its managers access to our tracking data, so they know exactly where their orders are at any time. Our goal is to keep this facility and all other General Motors factories running smoothly for the long haul. ExpeditedFreight.com ships into and out of Fort Wayne proper, Goshen, Wabash, South Bend, Lima, and Elkhart. For more information or a free estimate, call us today at (317) 800-7222.